I had plans, you know. There were extensive plans for a month of Whole30 recipes in January, three posts a week. Big plans. Delicious, but simple recipes that would get you over the hump, but also keep you wanting more healthy food long after your Whole30 was over. Well, then reality set in and taking care of an infant is hard and the state of the country, if not the world, right now is distracting if not depressing and has made me feel vapid and tone deaf talking about food. But life must also go on. Baby Bake still has rough days but we are getting the hang of it, slowly but surely. And I am finding ways to get involved in my community and as a concerned citizen that make me feel a little more comfortable going about my day-to-day life without feeling complicit with behavior and policy I find objectionable (democracy is a beautiful thing). But, most of all, because February is Valentine’s month, and we all need a little love right now. By love, of course, I mean chocolate. We all need chocolate right now and a lot of it, if you ask me. That’s why I designated the whole month of February as Valentine’s, so that we could self medicate, er, *indulge* for four weeks, not just one day. (What’s that I hear? Your Whole30 rolling over in its grave? #sorrynotsorry). I actually have a few non-chocolate recipes planned, but get ready for one very sweet month! 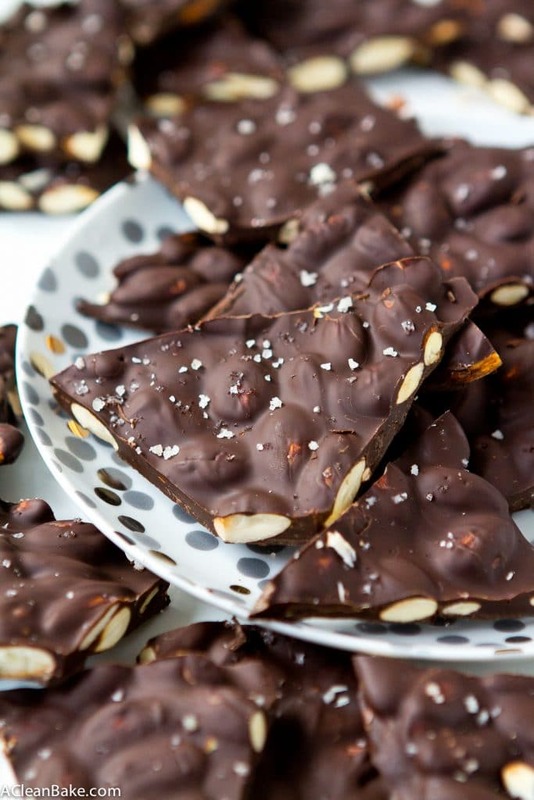 First up: super easy, no bake toasted almond chocolate bark! 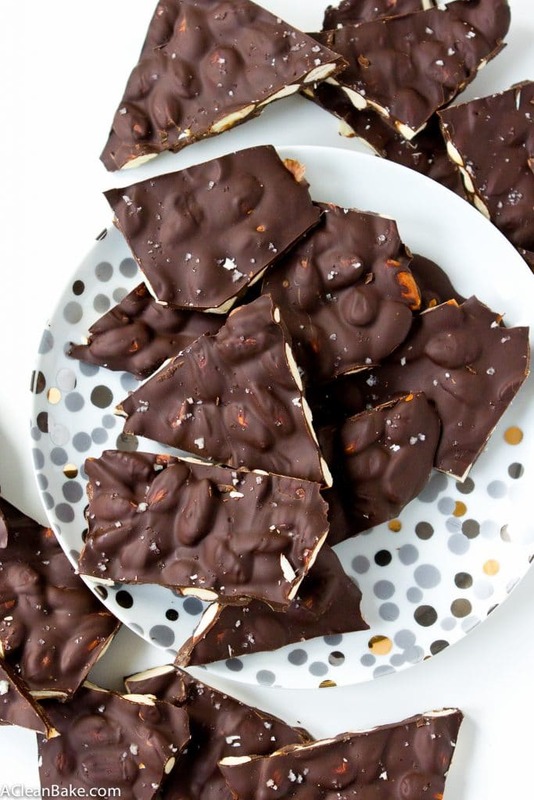 When you need a chocolate treat stat, try this no-bake toasted almond chocolate bark! It's so easy it practically makes itself (gluten free, paleo, vegan). Cover a baking sheet with a silicone nonstick pad and set aside. Toast the almonds in a dry pan on medium high heat, shaking periodically, just until they start to give off a nutty aroma. Remove them from the heat and pour them out onto the prepared baking sheet. Arrange into a large layer, spaced about 1/2" apart (no need for exact spacing, that's just a ballpark). Set the pan aside. 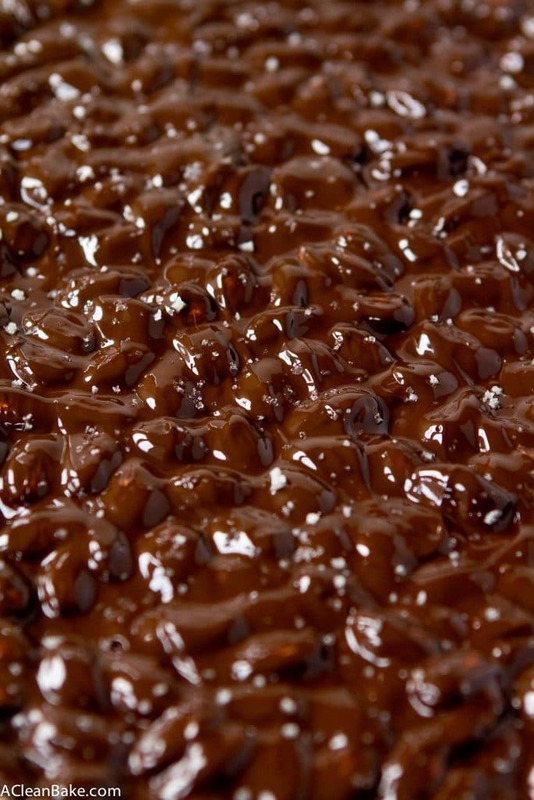 In a large, heatproof bowl, microwave the chocolate in 30 second increments (stirring between) until melted. Stir in espresso powder, if using. Pour the chocolate over the almonds and use an offset or rubber spatula to spread the chocolate so that all of the almonds are covered. Immediately sprinkle evenly with sea salt. Use as much or as little as you want, depending on your preference for strong sweet & salty flavor. Allow the chocolate to set at room temperature until it solidifies again, then use a large, sharp chef's knife to chop into pieces. 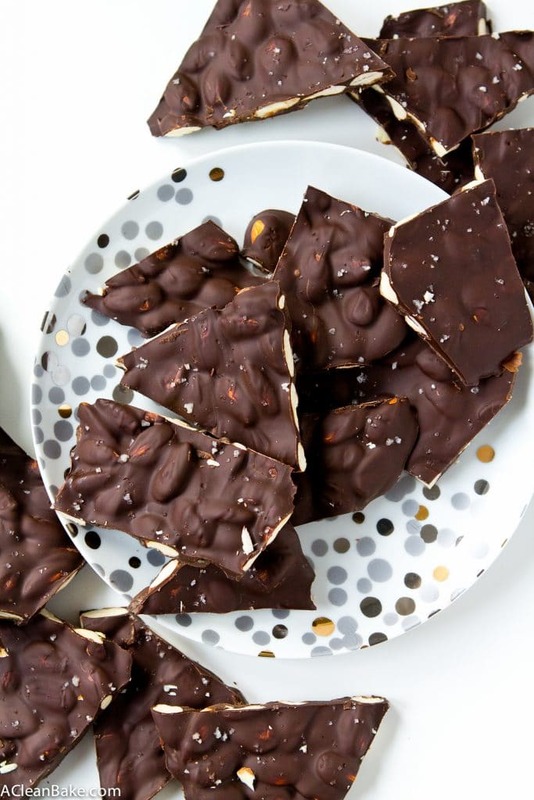 You can use chocolate chips in place of solid chocolate, if that's all you have on hand. No need to chop them before melting. You can use whatever salt you have around, but I'd advise against table salt. Use the best quality you can. I love the taste of grey sea salt but you can use Himalayan or whatever you prefer. The yield entirely depends on how large or small you cut your bark. It's enough for 1 large or 2 medium gifts (maybe 20-25 pieces) or you can chop it into 40-ish smaller pieces if you want more reasonable portions. The nutrition info below reflects the smaller pieces. Life definitely gets in the way of plans from time to time and I hear ya on the state of the country…it’s scary out there, man. If it makes you feel better, I for one consider homemade chocolate treats like this to be healthy…we all need our chocolate vitamin, you know 😉 Definitely a beautiful dessert for Valentine’s Day/everyday! 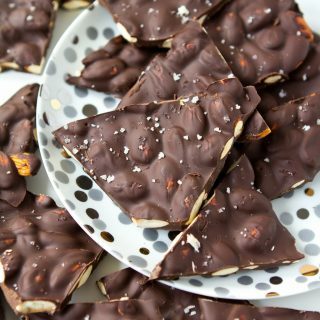 If this almond chocolate bark is a part of reality, then I’m all for it! I LOVE the short ingredient list! V-day has never looked better or healthier! I added a few good shakes of cinnamon with the coffee powder. Yum! You can feel free to add a few drops of liquid stevia, but there is already going to be plenty of sweetness to your chocolate. Use whatever % you prefer (65% for sweeter, 72-80% for a darker chocolate flavor).